Never be curious about any color you see on your screen. 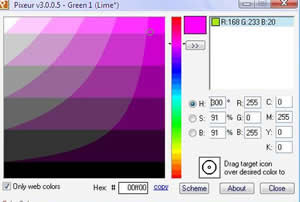 With Pixeur you can easily view the color value RGB, He x, and Long value of any color or pixel you see on the screen. This free tool is very helpful for designers to find color values. Just drag the ‘Target icon’ over the desired color and see the values of HEX, RGB or CMYK. Pixeur will also keep a history of all colors you have selected, so going back is as simple as choosing the color from the Color History list. How to add HTML code in blogger post?